Many of us are aware of the endocrine disrupting potential of BPA (bisphenol-A) used in many plastic containers and inner linings of cans that the food processors label “BPA Free” as a marketing device. Unfortunately, the replacement chemical, BPS (biphenol-S) has been discovered with, at least, the same endocrine mimicking dangers or perhaps even worse effects on hormonal health than BPA. This leads to conscientious consumers being duped into exposure from biphenol endocrine disruptors from containers labeled “BPA Free” if other bisphenols such as BPS are used. Those who aren’t duped have to deal with concerns about labels and do more research. But there’s one ubiquitous item that openly contains BPA in order for it to function, and that is ink-less printing paper. 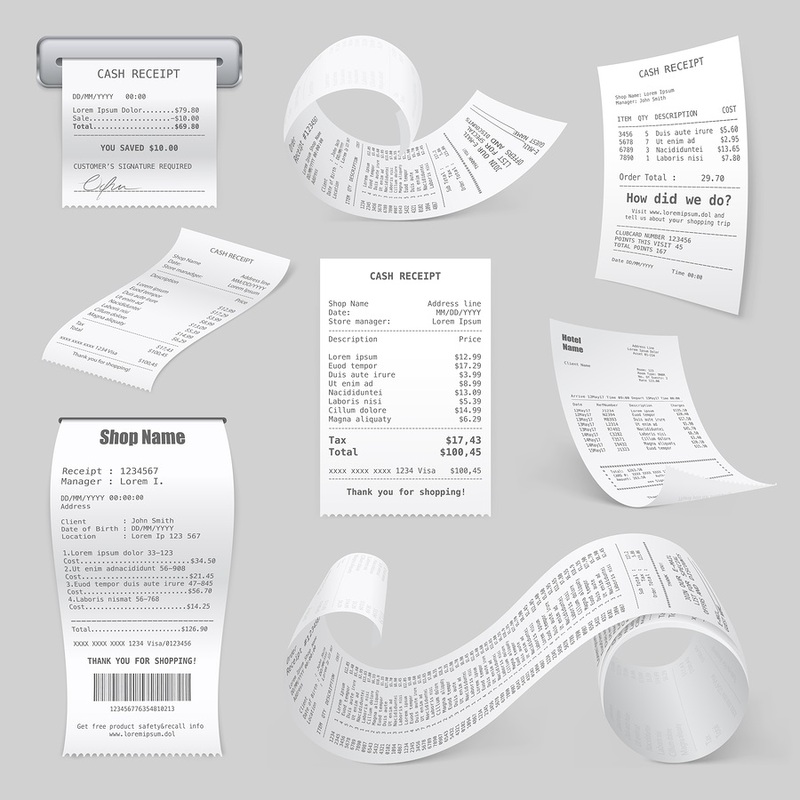 Thermal paper is used by almost all cash registers, ATMs, medical equipment, and other machines that offer printouts. There have been concerns about skin exposure with BPA thermal paper and its consequences, and there are studies now confirming that handling these receipts are exposing our bodies to BPA toxicity even more than consuming food in BPA packaging. A 2017 study discovered that skin contact with thermal paper is a pathway that leads to BPA in the body at higher levels and with longer residual effects than oral consumption of foods or beverages packaged in BPA plastic containers. This study, Prolonged Exposure to Bisphenol A from Single Dermal Contact Events was published online by the journal Environmental Science and Technology on July 31, 2017. Knowing that thermal paper is coated with BPA, the researchers were curious about the pharmacokinetics  of BPA “dermal exposure” and how it compares with “dietary exposure” to BPA. So, they measured serum and urine samples of six volunteer male subjects who were exposed to both dermal  and dietary BPA exposures and monitored their BPA levels and the lengths of time it took to clear BPA from their systems. The thermal papers were handled for only five minutes then they washed their hands after two hours. A week later subjects returned for a bout of dietary BPA and serum, and urine samples were closely monitored the same way. An extreme example was when one individual, who did the bare skin handing of thermal paper a second time, had detectable BPA showing in urine and serum samples for nine days. But after dietary BPA exposure, the same subject cleared BPA from his system within 24 hours. The other five subjects’ times varied with both dermal and dietary BPA exposures. But half of the subjects had traces of BPA from thermal paper dermal exposure for a week, while clearing dietary BPA from their systems took much shorter times. Compared to dietary BPA exposure, dermal absorption of BPA leads to prolonged exposure and may lead to higher proportions of unconjugated BPA in systemic circulation. This graphic is from this study’s abstract . It seems that our internal ecosystems, with their livers and gastrointestinal (GI) tracts, are geared to chemically break down BPA structures into harmless compounds for elimination faster than dermal BPA exposure with chemical mechanisms, which are unknown at this time. Considering that skin exposure leads to infiltrating the blood system, which bypasses the digestive system, it makes sense that BPA dermal exposure can lead to higher amounts of intact BPA remaining in one’s system. It also makes sense that repeated dermal exposure to BPA among individuals who handle thermal paper as part of their jobs, or anyone who handles thermal paper on a fairly regular basis, may be major contributors to the almost 100 percent of tested Americans showing levels of BPA from urine samples. CDC scientists, between years 2003 and 2004, measured 2,517 participants’ urine to determine the amount of BPA that had gone through their systems. CDC scientists found BPA in the urine of nearly all of the people tested, which indicates widespread exposure to BPA in the U.S. population. The survey participants ages ranged from adult to children six years old. So, there was a spectrum of young children out of the 2,517 whose involvement with plastic toys and other plastic items is a source of dermal exposure to BPA, which is used to strengthen many of those plastic items. One scientific article from medicalxpress.com  suggests that dermal BPA exposure is responsible for higher numbers of consumers with traces of BPA in their systems than what was once estimated that the numbers would be if only dietary BPA was considered. The same online magazine briefly summarized three studies taken around the time of its publishing in November of 2010. A French study simply proved BPA is easily absorbed through the skin. A Harvard epidemiological study measured BPA urine sample levels from 389 pregnant women and then correlated the data with their occupations. Cashiers had the highest concentrations of BPA, while others had considerably lower levels. The University of Missouri-Columbia conducted tests on urine samples from 400 pregnant women in the Cincinnati, Ohio area. Again this proved BPA from thermal paper can penetrate skin, because the highest levels were among the women who were cashiers. The challenge comes mostly from the industry that supports using BPA in plastics manufacturing. A thermal paper industry group admits BPA is the layer of coating that creates the type of surface necessary to produce ink-less printing for receipts and machinery printouts. BPA is extremely stable and heat-resistant, it is used to make the coatings that give thermal paper the unique properties that allow for inkless printing. The various reported adverse effects of BPA are reviewed, and the potential mechanisms of BPA action are discussed. Although many questions remain to be answered, it is becoming increasingly apparent that exposure to BPA is ubiquitous and that the effects of this endocrine disruptor are complex and wide-ranging. In addition to cutting through the complexity of plastic containers with biphenol content to avoid BPA or its endocrine disrupting analogs such as BPS, it’s wise to thoroughly wash your hands shortly after handling thermal paper. Those who handle thermal paper often as part of their daily occupational routines may consider searching for gloves that allow dexterity while not containing any bisphenols. In the video below, Dr. Michael Greger uses different studies than what were presented in this article with similar results regarding the BPA thermal paper issue.